(CNN) — When Olympic skier Chirine Njeim tells people she’s from Lebanon, they often laugh in disbelief. Now at the Vancouver Winter Games, and competing alongside two other athletes from her home country, Njeim still has to convince people she’s telling the truth. “A coach from another country asked me in the elevator the other day where I was from. I said, ‘Lebanon’ and he just started laughing,” Njeim, who is competing in the Ladies Giant Slalom Wednesday, told CNN. “I think people think of Lebanon as a desert with sand and camels, but nobody thinks of it as a place that has snow … He was shocked. He just laughed at me … ” she said. Little did that coach know, there has long been downhill skiing in Lebanon — and world-class ski resorts to boot. That means there’s a clear view of the Mediterranean Sea from the slopes of Mount Lebanon on most days, according to Kraytem. Lebanon currently boasts six resorts: The Cedars at Mount Makmel is the largest, while Mzaar (ex Faraya-Mzaar) is the favored destination of the jet-set (it’s also where Njeim got her start aged three). Two of the resorts are members-only private mountains. And an expensive seventh resort is in the works, according to Ronald Sayegh, of Ski Lebanon. “The quality of the snow is one of the main reasons professional skiers love our slopes. Powdery on the surface and hard underneath,” explained Joanne Zarife, a manager at the five-star Intercontinental hotel at Mzaar. Even though the slopes face north, preserving the snow, the region’s sunshine makes the air mild, even warm, she told CNN. “The terraces at the bottom are constantly filled with apres-skiers enjoying a cold drink under the tanning sun,” said Zarife. A lot of expats living in the region come back to ski, Lebanese locally come, Europeans, Australians and South Africans … ” he said. “A lot more people now know there’s beautiful skiing in Lebanon,” said Njeim. Last year a record 50,000 people visited the country’s ski resorts, according to Tony Khoury, President of the Lebanese Ski Federation and Head of the Lebanese Olympic Delegation at Vancouver. At more than 3,000 meters, the peaks of Lebanon’s tallest skiing mountains at The Cedars resort top the highest point of the Whistler Blackcomb resort (2,284 meters approximately), one of the main venues of the Vancouver Games. Skiing only came to Lebanon in the 1930s though, brought by a student returning from Switzerland where he had developed a passion for the sport at school. In the 1950s, the sport’s appeal really opened up, after chairlifts arrived. And today it’s not just downhill skiing that draws the crowds. From just ten snowboarders in 1991, today anywhere from 30 to 60 percent of visitors are riders, according to Ski Lebanon. 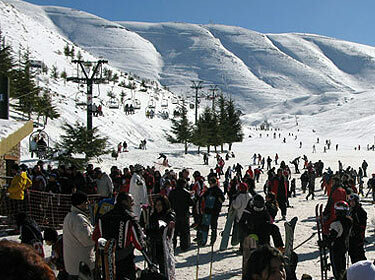 Lebanon’s high, sunny plateaus also make it ideal for cross-country skiing and snowshoeing, they say. Exposed to the best of country’s ski scene an early age, Njeim was quickly hooked. As a child she would watch the sport on television and tell her friends that she wanted to race in the Olympics. “People thought it was kind of hilarious,” Njeim recalled with fondness. article like yours. It’s pretty worth enough for me. In my view, if all webmasters and bloggers made good content as you did, the net will be much more useful than ever before.